Honeymoons are changing. While there are couple who are still jetsettting off to some island with good weather and great drinks, so many couples are opting for a road trip honeymoon. It's such a fun way to get in good quality time and lots of sightseeing. If you're planning a road trip honeymoon, there are a few things you need to consider and take care of before you go. We road trip a lot and I always make sure to wear cozy clothes. It just makes the car ride so much better. Now, I'll be honest. I was definitely one of the "leggings are not pants" people ... until someone sent me a pair of leggings. Now I'm a "legging are the perfect road trip pants" person. They're so comfortable. And if you pair them with a loose top, it's such a good outfit to drive in. Be sure your fiance has an equally comfortable outfit. A pair of bagging cargo shorts might be best for him. And pack sunglasses, especially if you're driving during the day. Those are definitely key. You also want to pack ahead of time too, obviously. 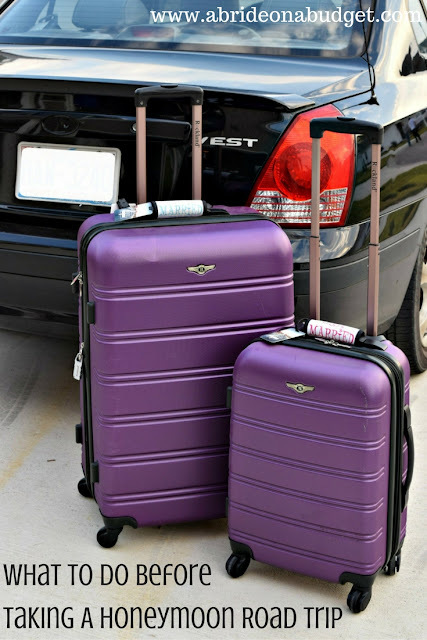 Be sure to check out our honeymoon packing checklist to help you figure out exactly what you need to pack and what you can leave home. Before you go, be sure to map out your route. If you like breweries and zoos, mark down the ones along your path. If you have destinations to stop at along the way, you won't be wandering aimlessly. Of course, if you see an attraction sign along the way that jumps out at you, make an impromptu stop. Have fun with your road trip and leave yourself room to relax along the way. You don't want to spend the entire time going from tourist attraction to tourist attraction. Schedule in some down time, but also set it up with pit stops. Definitely go with a balance. You don't want to drive long into the night and then have to find a hotel with vacancies. You might not find the best hotel or the best deal that way. Instead, book your hotels before you go. Since you're already planning your stops, you can find hotels around them. You can check into your hotel, drop off your luggage, and then drive around a certain city. I always use cash back sites when I book hotels too. You'll get back a percentage, so it'll save you money. Plus, you will usually pay less if you book ahead of time rather than if you just walk into a hotel and look for a room. I always pack snacks before we leave for a road trip. It's just such a waste of money to pick up a snack when you stop at a gas station because they're so overpriced. You'll have to stop for meals because you don't want to lug around a cooler all honeymoon, but you can pack nuts, chips, granola bars, and sweets. I make sure to pack one snack for each of us for every day. If I buy something like nuts, I'll also pick up plastic snack bags. I'll divide the nuts into bags. They're a lot easy than packing a huge container of nuts, plus it's cheaper than buying a bunch of small bags. I remember when we were young and would drive to Florida, my parents would get an entire map of our route. That way, we knew how to go. With a GPS in many cars and most phones, it seems like an atlas might be a bit archaic. But it's not! You might get stuck in traffic or around a closed road and need an alternate route. Or maybe the map has a landmark on it that your GPS would never make you aware of. You can keep this in your car, under a seat or in the trunk, for whenever you decide to take another road trip. It'll be fun to even draw on it and attach photos to the cover, turning it into a travel diary too. You want to make sure that you and your car are ready for your road trip. If your car needs any maintenance done, be sure you do it before your trip. Fill up your tires, get a tune up, and have your oil changed. Those are the big ones that we do ever time we road trip. Speaking of an oil change, you can get it done your local Walmart Automotive Care Center. And now, you can get your oil changed with Pennzoil® Platinum Full Synthetic Motor Oil. 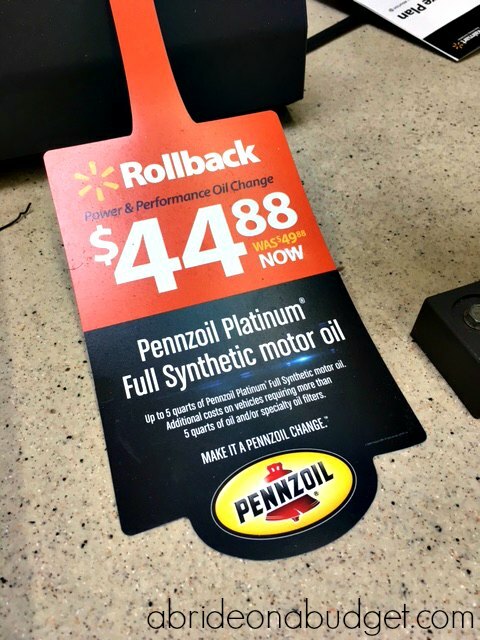 We knew all about Pennzoil when we lived up North, so I'm excited to know Pennzoil Platinum Full Synthetic is an option in Walmarts in the South (Florida, Georgia, South Carolina, North Carolina, and Tennessee). It's usually $49.88 on Rollback to $44.88 through December 27, 2016. We actually went to Walmart recently to check this out. The Rollback was advertised all over the Automotive Care Center. And with our oil change, we also got our fluids topped off. It was so easy to drop off the car and go about the rest of our afternoon. When it was ready, we got a call and picked it up. Simple -- and perfect for peace of mind! BRIDAL BABBLE: What would you do to prepare for a honeymoon road trip? These are a great trips. We never go anywhere without our GPS. My husband is NOT into asking for directions, so I need to make sure we know where we're going. Road trips are a great way to travel!! I think a road trip is a great idea for a honeymoon, a great time to talk! Great tips! Comfortable clothes are a MUST for road trips. What a fun way to "bond"! We did not do a road trip for our honey moon but before any big trip with the kids I get the car checked out.